The photographer Edwin Way Teale said "The world's favorite season is the spring. All things seem possible in May. ", and that certainly seems true. Springtime has a freshness and a sunniness that just begs for fresh starts. The month of May also has a sort of calmness to it that asks us to let it unfold naturally, being as nurturing and patient with ourselves as we are with the flowers that are starting to grow. In "Shades of Pink", Brana offers crystal suggestions for emotional support. Rose Quartz is our most popular pink crystal but there are many others, such as Rhodochrosite and Pink Tourmaline, for you to fall in love with! Our second article, "Grounding Crystals" is by Rachel and teaches us about hte concept of energy grounding, as well as sharing crystals that can help with this. It's not just metpahysical practitioners who need grounding, everyone can benefit from this energetic practice! We have a special bonus for you this month. 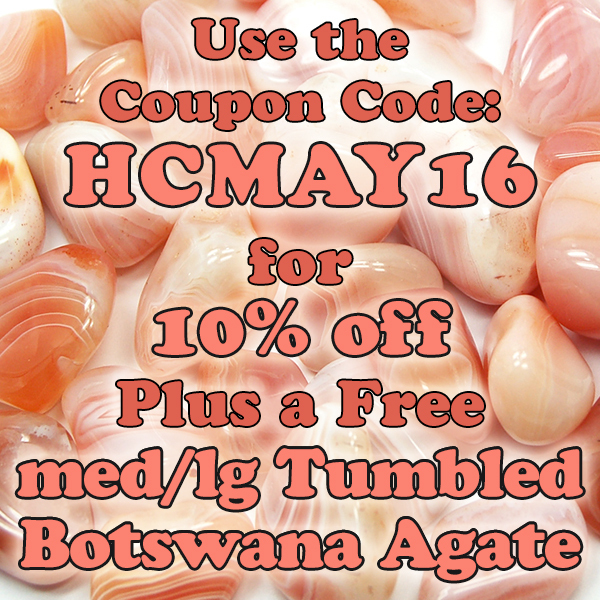 Simply enter the code HCMAY16 at checkout to receive a free Medium/Large Peach Botswana Agate, PLUS 10% off your order! You know what will happen once you do that? Your light will shine brighter, you heart will beat stronger, and you will discover that you have more energy and joy to share with the world. To help with this on an energetic level, you can work with pink colored crystals. Color is one of the important ways in which we experience world through our sense of sight, but many have found that colors have important emotional correlations. For instance, many experience the color red as stimulating, and blue as calming. Most are drawn to the color pink when in need of nurturing. We may be drawn to various shades of pink on different days; one hue when we want to feel more youthful, and another hue when we want to relieve sadness. The color pink is most commonly associated with love. In this article I’ll present four of the most popular pink-colored crystals: Rose Quartz, Rhodochrosite, Rhodonite, and Pink Tourmaline. As you will notice, they have similar energetic effects, the most important of which is healing emotional wounds and increasing self-acceptance. However, they also differ in subtle ways in which they work. While all of them can work nicely together on an energetic level, it is always good to work with one stone for at least a week, in order to observe its effects on you, before combining them with other stones. Also, make sure to cleanse all your stones when you first get them, and then every day after you work with them, using one of the methods presented here. Rose Quartz is one of the most popular crystals world-wide. The co-author of The Book of Stones, Naisha Ahsian, calls Rose Quartz “one of the most important stones of our time.” (331). While it generally works to strengthen the Heart Chakra and stabilize emotions, my experience with clients has been that it can induce a release of repressed or unprocessed emotions, so it is best to work with it in meditation at first, until you see how you react to it. If you feel an urge to cry, let it happen, as this is one way in which you can release the pent-up emotions. Other people can immediately feel a sense of relief and an increase of self-love when they wear it as jewelry. Rhodochrosite can assist you to recognize that you have outgrown some of your relationships; and that it may be beneficial for you to let them go. It can help you connect with your inner child and bring out joy, comfort, and inner peace that come with self-forgiveness. Rhodochrosite may also open you up to expressing love and affection more freely and to follow your dreams with courage and conviction. Sometimes we don’t realize that we are engaged in self-sabotage. Rhodonite is a great crystal to bring this to our consciousness and help us gently release those self-destructive tendencies. Through its energetic vibration it assists us in emotional recalibration so that we slowly train ourselves to react to emotionally charged situations in a new, more beneficial way. Additionally, both Rhodonite and Rhodochrosite can help with discovering or re-discovering our talents and gifts. Rhodochrosite does so by helping us look inside, and Rhodonite by bringing those talents/gifts to the light of the day and expressing them. Thus we are healed on several levels – through the joy of self-expression and through the appreciation that we receive from others. In that sense, these two stones in combination can help one discover one’s life purpose. Pink Tourmaline* helps with releasing worries and stress and replaces them with kindness and tolerance. It stimulates feelings of joy and helps with spiritual growth as we release old emotional patterns. Rubellite has additional properties of helping us feel safe and secure in our world, providing us with greater emotional strength, and opening the heart to perceive and receive abundance. Thus it leads us to generate a sense of well-being. I hope that you are inspired to make that change. Do it at your own pace -- however much and however fast you are comfortable doing it! Let us know how it goes! * The shades of Pink Tourmaline vary from pale pink to deep red and this often affects both their energies and how they are classified. The deep red shade of Pink Tourmaline is called Rubellite (and it also called Red Tourmaline). Disclaimer: Crystals are not a medical treatment and should not be used as a replacement for medical care. Please consult your healthcare specialist for your particular needs. Simmons, Robert and Naisha Ahsian. The Book of Stones: Who They Are And What They Teach. 2006. Hall, Judy. 101 Power Crystals: The Ultimate Guide to Magical Crystals, Gems and Stones for Healing and Transformation. 2011. Gienger, Michael. Crystal Power, Crystal Healing. 1998, 2009, 2015. In metaphysical communities the idea of grounding is often tossed around, but rarely clearly defined. Consequently, many people don’t understand the importance of grounding. So what does it mean to be grounded? In the strictest sense, to be grounded is to be connected to the planet. It means having your base and earth star chakras open and receiving earth energy, like roots in a tree. (In this scenario you are the tree.) Thus, grounding keeps you stabilized and rooted in the reality of existing on planet Earth. Oftentimes in metaphysical communities, where the focus is placed on opening the upper chakras, the idea of grounding is considered detrimental to your intuitive abilities and your journey. In reality the opposite is true. Grounding is a crucial aspect of any metaphysical practice, especially because we live on planet Earth. Grounding does not just affect your lower chakras, but your upper chakras as well. If you are well grounded you will be able to think more clearly, process all of the intuitive information you’ve gained better, apply the knowledge gained to your life, and able to move between materialistic and metaphysical cultures more easily. Grounding also allows you to be more aware of your surroundings; it gives you a mental clarity that is extremely important when recognizing the importance of energy and spirituality in your daily life. If you live in a rural area or work with the land a lot you may not need grounding as much as other practitioners. In these cases you receive grounding energy directly from your time walking, running, or working with the earth. However, if you live in a more urban environment and are not able to deal with dirt frequently, the following crystals can help you ground in the absence of actual earth energy so you can be your best in any situation. This stone primarily focuses on your connection to the earth. It opens your feet chakras to keep you grounded. This metallic crystal not only grounds you, but aligns all of your energy bodies. In doing so it brings a sense of peace and harmony to you. Its wonderful weight not only grounds you, but balances your energy and enhances your mental capabilities (such as clear thinking and memory). Aside from grounding, this crystal is excellent for clearing your head and helping you gain insights into whatever situation is at hand. Not only does its physical weight aide its ability to ground, Lodestone can balance the yin/yang energies within you. It also can temporarily align your aura and chakras. Often confused with Lodestone, this crystal has a different set of skills in addition to grounding. It stabilizes and balances you on all levels (physical, mental, emotional, spiritual), giving you endurance for the day. Similarly to Black Calcite, Obsidian focuses on establishing and maintaining a connection to the earth. It also helps you smoothly integrate the spiritual lessons into your lifestyle. This stone aides your mental agility while it grounds you. It enables you to concentrate more clearly. This crystal is perhaps one of the best grounding multi-taskers. It hones your survival instincts, enhances mental abilities, and helps you to stay in the present moment instead of worrying about the past or future. Eason, Cassandra. The Illustrated Directory of Healing Crystals: A comprehensive Guide to 150 Crystals and Gemstones London: Collins and Brown, 2010. Hall, Judy. The Crystal Bible: A Definitive Guide to Crystals. Cincinnati: Walking Stick Press, 2003. Melody. Love is in the Earth A Kaleidoscope of Crystals: The Updated Reference Book Describing the Metaphysical Properties of the Mineral Kingdom. Wheat Ridge: Earth-Love Publishing House, 2005. Permutt, Philip. The Crystal Healer: Crystal Prescriptions That Will Change Your Life Forever. New York: CICO Books, 2007.